I've begun laying out the areas for more gold couching and the third panel of the vest. I first drew everything out with a large piece of sidewalk chalk (useful stuff!) 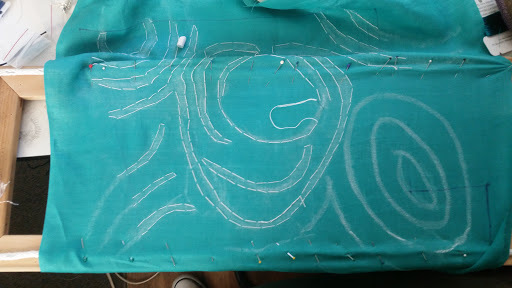 and then quick basting stitches to outline so that way when I'm working I don't care that the chalk has rubbed off. I've stapled rope to the edges of a stretching frame so that I can pin the work in place as I'm doing quick stitches. It's not taut enough for me to be comfortable doing elaborate embroidery, but it's enough for this kind of thing.